Our main stroller is an Uppababy Vista 2014 model in Black. I remember making the decision back in 2015, tentative about making big ticket purchases, before E made his appearance and we would know everything is okay. West Coast Kids had a clearance sale on older 2014 models, so we got it for $599 or something, cheaper than the regular price of $900 or $1,100 or whatever. And far cheaper than 2015 stroller was asking, like $1,200. We didn’t know if we wanted a single or double stroller but a double would be somewhat easier to sell and the clearance was only on the double stroller. I couldn’t decide on the colour, either. Originally we ordered Silver because Red sounded showy and what a very Chinese person would gravitate towards. 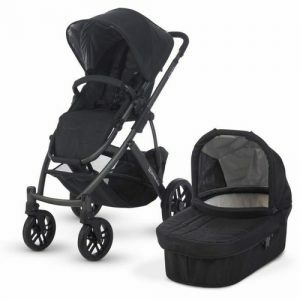 While we waited for the stroller, even Silver sounded tacky to me so we switched to Black and it’s soooo boring. We should have gotten the Navy but I naively thought it wouldn’t be a nice contrast. All Uppababy strollers are nice except boring Black or boring Silver! One of NPY’s uncles offered us some kids stuff and amongst those items was an umbrella stroller. Since it sounds like you can’t get by without an umbrella stroller, we took it and then laughed because we realized his uncle must have gotten it second- (or third-)hand as well. It is such a retro fantastic and basic POS. 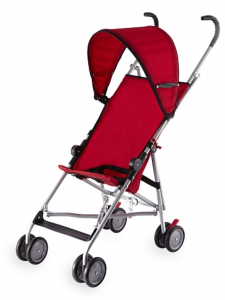 I spent an afternoon with a new mum who was visiting her parents in Vancouver and she was using a similar stroller (the Toys’r’Us one, with panda print, I recall) and it started to torrential rain and her poor infant in her scant summer attire was entirely unprotected. Meanwhile, E was completely protected in his fancy, elevated Uppababy complete with a rainshield. Our retro-unfantastic stroller has accompanied us on every trip since E was nine months old as we don’t want to deal with the weight of the Uppababy and risk it getting damaged during handling. This well-traveled stroller has been to Halifax, Toronto, California, and on a cruise. We don’t have to worry for a moment when we hand it over when we’ve gate checked it. In fact, if it didn’t show up at the destination, I wouldn’t have cared too much! 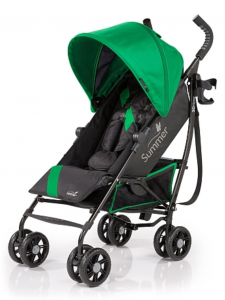 On Sunday, during my usual jaunt to London Drugs with E, I saw the Summer Infant 3D-One Convenience stroller was on a Buy It Now sale, marked down from $170 to $100. If we got a friend who is an LD employee to help us, we could get a further at least 20% off. We have “suffered” a lot with that throwback of a basic stroller. Am I being materialistic and a mindless consumer? Are we falling for the Kids’ STUFF industry marketing that tells us we all need a second a stroller? We live in the city in a condo, mind you. But we have had two strollers all along and have used both and we’d be replacing the dinky one. Still, when the umbrella stroller seems so feature-full it starts to feel redundant. But then, why shouldn’t both of your strollers carrying your precious cargo be maximally comfortable?? We haven’t been articulate in the guidelines for which stroller we use. I guess the umbrella stroller has been hanging out perpetually in our trunk and so we can use it when we spontaneously go somewhere. We consciously decide to use the umbrella stroller when we go on a road trip and want trunk space for shopping, or when we have taken a flight somewhere. The big stroller stays upstairs with us, ready for a stroller around the neighbourhood. When NPY and I stroll, we appreciate that we can put all our personal effects in the stroller. When I take E out alone and run errands and shop, the basket is priceless in its use. These days, we fold up the big stroller because we can fold it up with the rumble seat facing forward and it blocks the storage room we don’t want E to access. Double win. I dispatched NPY to check out the stroller when he got home. And we decided to get it the same day because as far as we could tell, there was a “No Rainchecks” policy for this sale and besides the floor model, there was only one unopened box. A former LD employee told us that our LD has the largest baby/children’s section because market dictates it. So we figured the stroller might not be there a day later. Sure enough, when NPY went to get it, he saw another couple hovering around it, presumably checking its specs and reviews online, but lost out to NPY who swooped in to get the last box. Haha. I am unreasonably excited to unbox and use the stroller. Ack, that is what has become of my life.